It’s all about the sun, sand and sea at Tawantok Beach Villa 1. Located along a paradisiacal coast in quiet Lipa Noi, this five bedroom property offers direct beach access and uninterrupted ocean vistas. Featuring a full range of modern amenities, sun-dappled outdoor spaces and a stylish, inviting decor, Tawantok Beach Villa 1 is a great bet for large group getaways with friends and family. 10 guests are comfortably accommodated across five bedrooms. Each of the rooms feel airy and spacious, and are decked out with wood panel flooring, a neutral colour scheme and quality linen. Other amenities include air conditioners, private ensuites with indoor-outdoor showers and safety vaults. The sparkling infinity pool is just steps away from the beach. Poolside recliners, set under the shade of sun umbrellas look out to the ocean. There’s also a covered area kitted with alfresco dining and lounging furniture - unsurprisingly, this is the focal point during the evenings, where guests often congregate for sundowners and dinner parties. 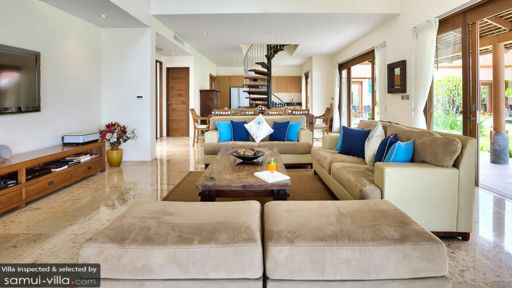 The interiors of Tawantok Beach Villa 1 are stylish, yet inviting. You’ll feel right at home the moment you step in - the indoor lounge feels homely with its plush couches and soothing colour scheme, the spacious 10 seater dining set comfortably accommodates large groups and the open kitchen comes equipped with everything you need for self catering. Large gallery windows let in plenty of sunlight. Glass sliding doors frame the living area, providing easy access to the outdoor spaces. Tawantok Beach Villa 1 is a full-service property. A private chef, daily breakfast, villa manager, concierge, baby cot and high chair are included with your stay. 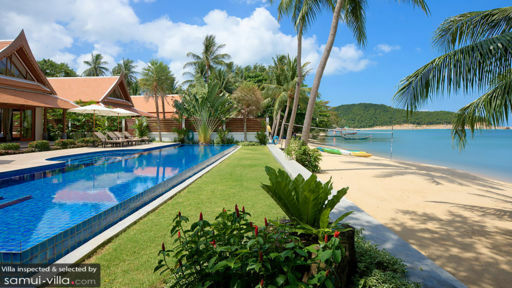 Tawantok Beach Villa 1 is located in front of Lipa Noi Beach in south Samui. Unlike the tourist hotspots of Chaweng and Lamai, the vibes here are tranquil and laid back, making the region a great option for families and vacationers seeking a relaxed getaway. Away from Lipa Noi Beach, there’s Nathon night food market, a weekly outdoor market with a lively atmosphere and a variety of street food vendors. Unwind with a yoga class at Marga Yoga, a seaside retreat or with a spa ritual at Baan Thai Spa by HARNN. To experience an energetic nightlife scene, hop into a car for a 30-minute ride to Lamai Beach. Stay in to enjoy an incredible in-villa dining experience, or dine out at one of the excellent restaurants peppered around the vicinity. The Five Islands and Island View Restaurant are our recommended venues for fine dining. For a more casual, fuss-free dining experience, try out one of the many seafood restaurants at Thongkrut Fisherman’s Village (pro-tip: you’ll enjoy some of the freshest seafood dishes on the island here). And don’t miss out on the decadent Sunday brunches that Nikki Beach Club is known for!